ONLY the rich and famous would expect a flash mob at their wedding day, but one Gympie couple received just that. Childhood sweethearts Jacqueline Parr, 25, and her husband John Litzow, 25, watched on as their entire wedding party got on the dance floor and started doing a choreographed dance to the sound of Beat It by Michael Jackson. "John and I were a bit confused at first. We were gifted with a flash mob and we couldn't believe it,” Jacqueline said. The couple grew up in Bundaberg where they met as teenagers. They lived in Brisbane, Gladstone and Toowoomba before making the move to Gympie. Jacqueline is a secondary English and drama teacher at St Patrick's College and John is a carpenter on the Sunshine Coast. One hundred and ten guests attended Jacqueline and John's wedding on September 22 last year at St Patrick's Catholic Church. Guests came from as far as London as well as Mackay, Gladstone, Gold Coast, Brisbane, Bundaberg and Gympie. The reception was held at Pie Creek Hall. Jacqueline had her two sisters Andrea and Carissa as maids of honour. Her best friends Emma, Jessica and Rhiannon were the bridesmaids. John's good mate Jeffrey was the best man. His brother James and three friends, Jason, Jamie and Daniel, were his groomsmen. "Our groomsmen wore navy suits with brown leather accessories and navy and pink bow ties. The bridesmaids wore different dresses in dusky pink tones,” Jacqueline said. John wore a navy suit, with a blue and navy bow tie. Jacqueline's dress, a two-piece skirt and top with a lace overlay, was made by Dressmaking by Harte. Jazmyn and Max from Aesthete Photography and Videography captured the event. The couple honeymooned in Bali. "Our honeymoon was actually a surprise, my sister Carissa organised the whole thing for us, and gave us an idea of what to pack. "We didn't find out where we were going until we opened our tickets at the airport,” Jacqueline said. 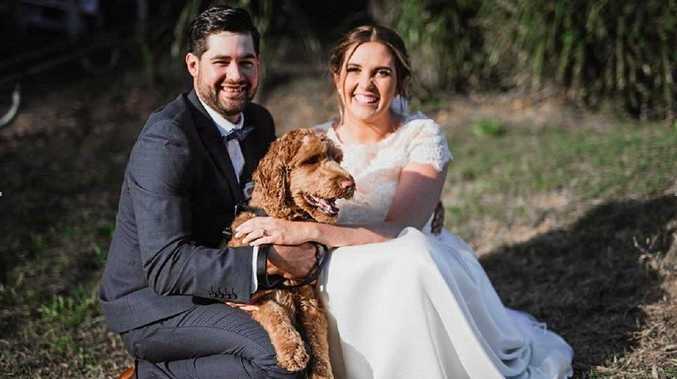 Their pet labradoodle Duncan joined in on the couple's joyous celebration.